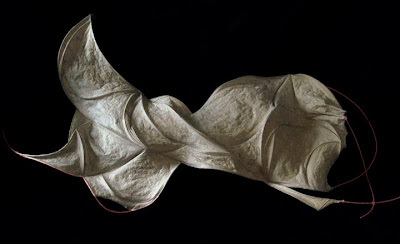 Mary Patton is a paper sculptor currently living and working in Chicago. By day she is a Math tutor with AUSL; by night a free-thinking, nose-to-the-grindstone paper making MacGyver. She is in the process of making a website, if you adore her work, email her for sales inquiries. Mary is also a burlesque dancer, gluten-free cookery queen, and all around nice gal. Visit Mary's tumblr page for updates from her. At PBI this year, Mary took a class with Lee Running and Mary has very kindly taken some time to share that class with us here on my blog. At the intersection of pulp, tradition, and the avant-garde is where you will find Lee Running. At least, this is where I met her at PBI 2012-in the Clute on Oxbow campus, where I became her studio assistant for four days of pulpy bliss. As a student, Lee was introduced to paper as a medium while working for Dieu Donne in NY. It is considered the gallery for papermakers -- both experimental and traditional. 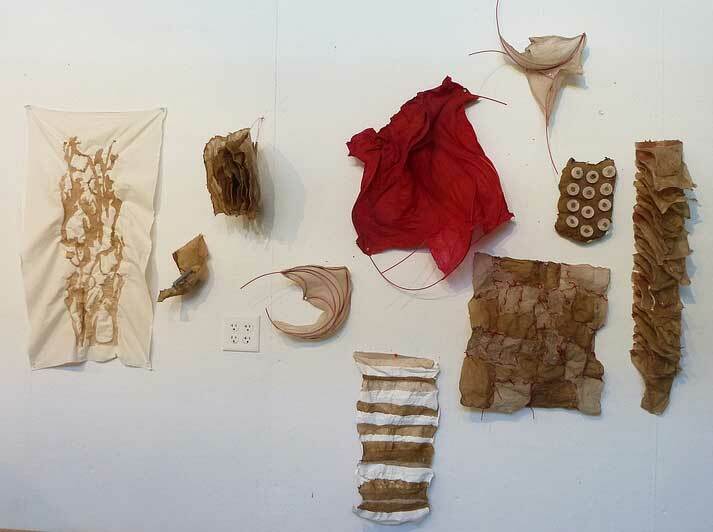 While at Donne, Lee had firsthand experience working with paper in non-traditional ways. After being bitten by the pulp-bug, she read Tim Barrett's book Japanese Papermaking: Traditions, Tools, and Techniques that outline completely the traditional process of hand papermaking in Japan. This book, she says, "changed her life" in such a way that she wanted to "make paper that looked like paper." So Lee Running set out to the University of Iowa to work with Tim Barrett. The rest is history -- as they say. 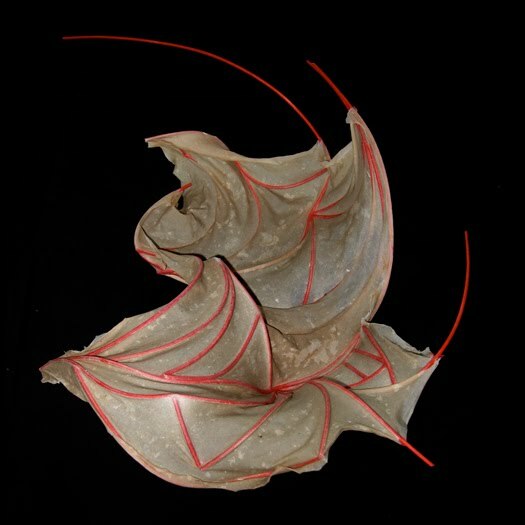 Since that time, Lee has composed a body of work involving paper as the medium, nature as the message, and currently holds a position teaching sculpture at Grinnell College in Grinnell, Iowa among other appointments. Please consult her website for more more information and to view her beautiful work: leeemmarunning.org. One of the many things I learned from Lee was that all stages of fiber preparation are to be respected. Dried sheets of flax, cotton, and abaca came to us from Carriage House in New York. These sheets were soaked in buckets of water, measured to two pounds in each bucket and then completely hydrated to soak before going into the beater. After each fiber was beaten to the desired consistency the beater went through a thorough process of cleaning so as not to contaminate the next batch of fiber with the previous. On the first day of class we met outside at two long tables butted against each other, dotted with buckets, each student quizzically carrying a hard-boiled egg from breakfast. We were to make plaster molds of the positive and negative spaces of the egg for paper casting. From these molds and eggs we would, that day, cast both cotton and abaca fiber sheets. The class learned the finer points of plaster sourcing, the proper consistency of plaster to cast, and mold building. The two most important points being that: A lubricant is very important in release, and plaster over the meridian line of your egg will cause a painful separation of positive and negative. While our two-part molds were drying, Lee taught us the basics of sheet pulling, about molds and deckles, as well as the proper stance so as not to strain your shoulders while standing at the vat. Our first two days were instruction time and test making. By experimenting with restraint drying techniques students were able to see how temperature, and fiber type reacted to horizontal as well as vertical drying. The abaca fiber was "over beaten", that is to say it was beaten in a fiber beater for 5 hours, and had considerable strength. Upon drying, a flat sheet pinned on three of its corners to the wall would pull out the third corner causing it to stand out by an inch from the wall. By comparison the cotton fiber merely loosed the pin, and had a fluffy texture, as it was not restraint dried flat. Lee brought along with the fibers, a double boiler and beeswax. With this the class was able to coat its papers and sculptures producing some interesting effects. The paper takes on a luminescence, and weight; appearing less like paper and more as plastic. This is a technique I am excited to incorporate into my own work. Students were able to create exciting new experiments without fear of failure such as Shifu, the twisted paper threads native to Japan; wax dipped papers; pulp cast from wire and fabric molds; sewn, glued, and various cast constructions as well. Fibers were combined such as cotton and abaca to produce texture and tension. Hats, masks, baskets, and sculptural books were all made with joy. including some of Mary's work. The effects of the class, for me have been life changing. I am no longer considering an MFA in book arts but one in sculpture; sculpture centered on the merits and potential of paper. Indeed, I am running headlong into a world where paper looks a bit unlike paper and that is just fine by me. Thank you for sharing this with us, Mary!